This blog post focuses on two technology-based assistive devices that are designed to help individuals with vision impairments, WayAround and Aira (eye-ruh). These two products accomplish different goals, but both are proving to be of immense help to the individuals who have them. WayAround is a digital tagging system that allows individuals with vision impairment to place a physical tag on an item in their home. This tag is then scanned with the individual’s phone (without any use of the camera). Then, the individual can dictate notes about the particular item that will be saved on that particular tag. To illustrate, imagine you loved the feel of a particular shirt so much that you bought three in different colors. Well, with WayAround saving information about their color is easier than ever. When you go back to the shirts in your closet you can scan the tag to find out what color shirt you want. But that isn’t the extent of the uses for WayAround. They recommend using their tags for nutritional facts and expiration dates on food, tagging storage containers to be able to know their contents quickly and easily, and tagging items with directions (like face wash or a drain cleaner) to be able to use them effectively. Having WayAround allows you to quickly access information about any item at any time. Additionally, their tags don’t use batteries and they don’t need charged. The tags even come in four different forms: stickers, buttons, magnets, and clips. That way you have the right tag for anything you might need to remember something about. While WayAround assists individuals with storing certain information about items around the house or office, Aira is primarily for quickly getting helpful visual information about your environment in real time. Their device is a pair of glasses that are in conjunction with an app to get their “Explorers” (as they call their users) information quickly. The glasses contain a camera, microphone, and speakers. The Explorer puts on their glasses and, when they want to know something about their environment, can contact a live person at Aira who receives the live video feed from the glasses. Then the individual at Aira describes the Explorer’s visual settings in real time, allowing them to choose between different fruits at the supermarket or help their child as they learn to read. What’s impressive about Aira is the versatility. Explorers can call someone at any time, 24/7, to learn about any environment. Imagine being able to go on a safari, smelling the savannahs and listening to the wonderful sounds of the birds and other animals and then quickly getting in contact with someone who can describe what it all looks like to you as well. But it’s not solely for the adventurous, Aira can help someone browse a local store or watch a fireworks display. Additionally, the use of live people to describe the visual features of an environment allows the two individuals, Explorer and Aira contact, the opportunity to share in an experience. That aspect of preserving the human connection while taking advantage of technology fits right in with us at Disability Cocoon. Together, WayAround and Aira prove to be a powerhouse duo that works to assist individuals with visual impairments. It goes to show how many different applications there are for simple and effective technological solutions. We at Disability Cocoon hope you’ve found this information helpful and invite you to continue checking up on our blog to stay up to date on the latest developments in assistive technology. How Can Alexa Understand People with Speech Difficulties? 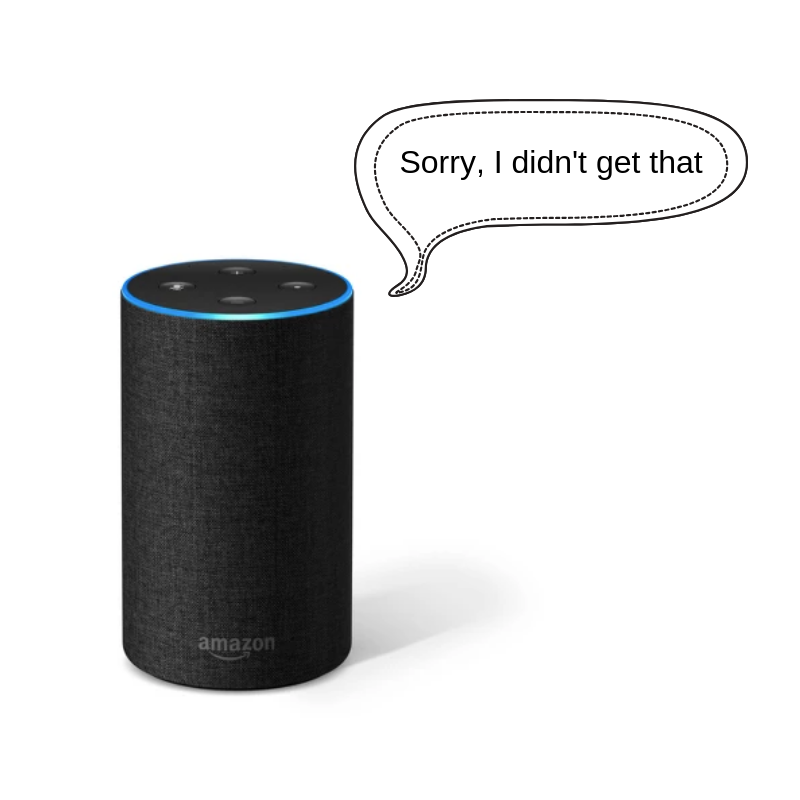 Most of us have experienced the occasional “Sorry, I didn’t get that” response from our Alexa enabled devices. In her article “When Alexa Can’t Hear You” for Slate Magazine, Moira Corcoran points out an often unseen problem with the rise in smart-home technology, particularly voice-based technology like Alexa or Cortana (thanks to ARRM Technology Resource Center in MN for bringing this article to our attention). For many people with non-standard speech patterns due to illness, traumatic injury, or disability, getting these devices to understand what they’re saying proves difficult. That’s because systems like Alexa use machine learning to teach their software how to understand spoken words by feeding it data from thousands of users. Most of the users that systems like Alexa get their data from have standard speech patterns. But when these systems are only programmed to recognize these common patterns, they aren’t able to understand non-standard speech patterns of people with speech disabilities. Corcoran also mentions a company working toward a solution for this problem, Voiceitt. They’re developing software that recognizes irregular speech patterns and pronunciation so that individuals who don’t pronounce words the same way as most people can still get all the benefits from their smart devices (video how it work). Disability Cocoon’s Dustin Wright sat down for an interview with Voiceitt’s Danny Weissberg during which he broke down Voiceitt’s plan to make this technology more accessible. They are currently beta-testing (think soft-open of a store or restaurant) the first generation of their app, which works on smartphones and tablets. The first generation of technology requires users to record words/commands they wish to use on their device so the device can respond to each individual’s specific speech. Sometimes it takes a while to get the commands recorded, but training Voiceitt to understand one individual’s pattern of speech means that it doesn’t matter what language you speak, Voiceitt simply listens to the sounds and executes the command. Additionally, even individuals with speech patterns that are far from standard can use their smart devices with this generation of Voiceitt. The second generation of Voiceitt is already being developed. This generation only requires that users record a sample of their speech reading certain sentences. After a user reads these sentences to Voiceitt, the app will be able to understand other words or commands that aren’t part of those sentences. It will learn how the individual speaks. This means no more training the app to respond to every command. Their third generation, though still in the distant future, will use the data collected from Voiceitt users to generate software that understands common types of non-standard speech among certain populations. For example, if many people with Down Syndrome use Voiceitt, the app will be able to see if there are any common ways those people pronounce words and phrases. That way it will already have some understanding of how people with Down Syndrome speak, removing the need for users to train the app themselves. To sum it up, the growth of technology and the convenience that comes with it is exciting, but we need to remember that when it comes to technology, if we’re not doing all we can to make it accessible to people with disabilities, injury, or any other condition, then we’re not doing enough. That’s what inspires us about the people over at Voiceitt, they’re working to make sure everyone can enjoy the convenience of voice-based technology. For people who want to see what Voiceitt is doing now, take a look at their page here. If you or someone you know is looking for a way to make Alexa or similar voice-recognition devices more accessible to people with non-standard speech patterns, let us know! Voiceitt will be expanding their beta-testing in the future and Disability Cocoon would love to try to get you in on it. We at Disability Cocoon like to highlight new and exciting technologies that work to help the lives of individuals with disabilities, the elderly, or people who just need some assistance in their day-to-day lives. While our last blog post looked at TechLab and their low-cost alternatives to potentially expensive assistive technology, this post takes a look at the people of KareCall and how their virtual calls are allowing individuals with health concerns to maintain or increase their independence. Some individuals need to answer questions about medical concerns on a daily basis so that their loved ones and caregivers can keep up with their health. While traditionally this required a caregiver to travel to the client’s home or the client to go to a care facility, KareCall calls the patient with a virtual caregiver to ask these questions. There are a number of benefits for both the provider and the client to having a virtual caregiver, instead of an in-person caregiver, ask about a client’s health. Providers no longer have to spend the time or money sending staff to clients’ homes just to ask a series of questions about their health. They no longer have to work around staff schedule. Additionally, in-person conversations are limited by physical distance. If your client is in a small town, hours away from the provider office, it can be costly sending staff that far for a few questions. Of course, any provider would gladly do that for their client, but now they don’t have to. KareCall offers an inexpensive alternative. It isn’t limited by distance, because it works over the internet. Providers set up the questions they need asked and the virtual caregiver makes the call at the scheduled time, every time. For the client, the benefits are even greater. Now there is no need to invite someone into your home just to ask a few questions. The KareCall virtual caregiver doesn’t require any small talk, doesn’t ask any questions other than the ones set up by the provider, and doesn’t linger in your home after your done. One quick call, that’s it. There’s no longer a need to make sure the house is always ready for visitors, you could answer in your bathrobe if you wanted to. KareCall allows individuals who aren’t ready for in-home staff to keep their freedom and allows concerned parties to stay up-to-date on the client’s health at the same time. KareCall is another example of what technology can do when it is harnessed with an aim to cut costs and improve care for individuals with health concerns. They represent the better parts of growing old in the twenty-first century. Technology should work for you, and that’s why we at Disability Cocoon will continue to highlight these new products and services that aim to improve the lives of individuals who require a little help. Often, people who don’t experience mobility issues or don’t have intellectual or physical disabilities take for granted the simple daily tasks we’re able to accomplish with relative ease. For others these tasks can be more difficult, even impossible without assistance. While a variety of technological solutions are being offered for these problems, the price tag may be a barrier when it comes to getting your hands on them. Connie Melvin and Richard Harrington at the Trinity Services TEC Lab in Joilet, IL are tackling that issue head on. They understand that technology doesn’t always need to come with a hefty price tag and fancy screens, sometimes all that’s needed are simple solutions to simple problems. TEC Lab produces DIY solutions for these daily adversities by using low-cost materials in creative ways. When Disability Cocoon’s own Dustin Wright took a tour of their facility, they showed a food/drink holder for wheelchair users with a long, flexible, semi-rigid straw for individuals who may find it difficult to grasp utensils or lift cups. What’s astonishing about this product is that TEC Lab manufactures it for nearly a tenth of the cost of comparable items on the market. As Connie says, that’s the power of DIY. Additionally, the folks at TEC Lab understand that it’s not just about making a product that’s cheaper, it’s about understanding the individual’s specific needs and fulfilling them. Some companies produce items that could be useful, but there’s usually one thing about it that’s just not quite right. If only it could be tweaked a little, then it would be perfect. TEC Lab gets this as well, they evaluate each individual’s unique needs in the development process to ensure that the finished product does exactly what they need it to do. They even offer classes in DIY, so that you, a caregiver, or family member can, you guessed it, do it yourself. We’re inspired by the people at TechLab who are working to break down the financial barriers between individuals and assistive technology. They recognize that everyone, especially individuals with mobility issues, physical or intellectual disabilities, or other impairments, deserves access to affordable assistive technology solutions. That fits right in with what Disability Cocoon is all about, sharing the great things people are doing with technology to help people improve their lives.